It’s almost spring and everything is in bloom! The weather is starting to get warmer and children would have their most-awaited school break soon. Yes – it’s time for a family getaway! In what most people consider the best season, spring is a great time for outdoor activities! From casual lunches to afternoon barbecues, picnicking is a popular activity for the whole family. 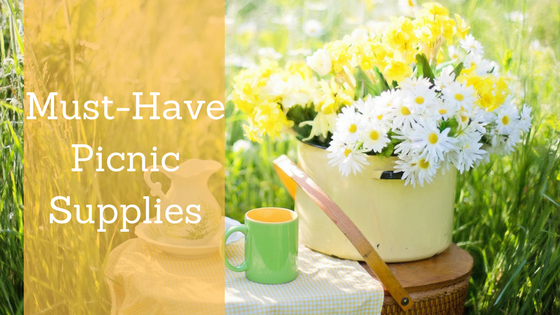 But before you head to the nearest park, do take note of this checklist of must-have picnic party supplies to ensure that you don’t miss out on anything important for a fun-filled day! Of course – what’s a picnic without a picnic basket? With hundreds of styles and colors to choose from online, picking the right picnic basket is tough. Whether you’re going with the traditional wicker basket or a more modern one with added features like a cooler, wine holder and extra pockets for your dinnerware, make sure it’s big enough to contain all your food supplies. Don’t forget your outdoor tableware set, including melamine plates and cups, and acrylic spoons. These are more preferred over traditional silverware because they are lightweight and less prone to damage. Very important – from opening cans and bottles to preparing meals on the spot, you should never forget to bring a compact, lightweight folding knife for picnic. Swiss army knife tools are ideal because you also get a screw, scissor and other tools you might use. Okay, it’s also not a picnic without that checkered fabric you lay on the ground and put your food on. Tablecloths used for picnics come in varying sizes. Make sure to choose the right size for your family. Picnicking is a great way for family members to bond with each other. You can make use of a tarp as a blanket mat for playing games or whenever you and your kids need something to lie on while reading a book or taking a nap. Before you head to the picnic site, make sure that you’ve already prepared the games (and the materials you need). Think of fun games that the whole family can enjoy. Here are some great picnic game ideas to get started. Pack plenty of plastic or disposable tableware and cutlery. At least two pairs for each person would be sufficient. Kids can get messy during a picnic. There’s a big possibility of food spills too. Pack plenty of napkins and disinfecting wipes just in case. While there may be sources of drinking water in the park, you don’t want to take chances. To be safe, bring bottles of water to stay hydrated and energized throughout the day. The food and snacks you prepare should cater to the taste of everyone who’s coming along. Make sure to have some sandwiches, pica-pica, cheese, chips, cookies for the kids, some healthy greens, and delicious watermelon skewers. Yum! Check this out for some easy-to-prepare picnic food ideas. Picnic is all about unwinding and a little drinking. When it comes to wine, many people prefer reds because they taste just as good under the sun as they are at room temperature. Don’t forget to bring a cork puller though. Another must-have. Be sure to bring a cooler for your drinks and refreshments. Kids love cold drinks during a warm day. You need it for your beer too. Cool bags or an icebox will also keep your food in the right temperature. Do you a book that you haven’t had time to read for some time? As you immerse yourself into the spirit of nature, what could be a more relaxing way to spend the day than to read a good book under the sun? What’s a picnic without good music? Get your lively playlist ready and hook your iPhone to a wireless speaker. Picnicking is all about the good stuff and having a great time. Now that you have all these things ready, it’s time to chill and prepare yourself for a memorable outdoor adventure with the whole family!